Please see the downloadable file below for the full verdict in the ICT case against Ghulam Azam. The case was admitted to be flawed by the judge himself. The judge said that most of the evidence against Ghulam Azam was based on documents, essentially news reports. Justice Kabir said that it was perhaps unwise to depend entirely on news reports since they were written immediately after the event without affording the journalist much time to think. “Books and journals, they are different. The authors get more time to reflect on the events and research the matter, which make them more authentic,” observed Justice Kabir. In this blessed month of Ramadan we are deeply disappointed and saddened by the unjust verdict of the so called International Crimes Tribunal in the case of our beloved father, Professor Ghulam Azam. We strongly reject any suggestion that he was responsible for the crimes he has been accused of, and believe that he has not received a fair trial. 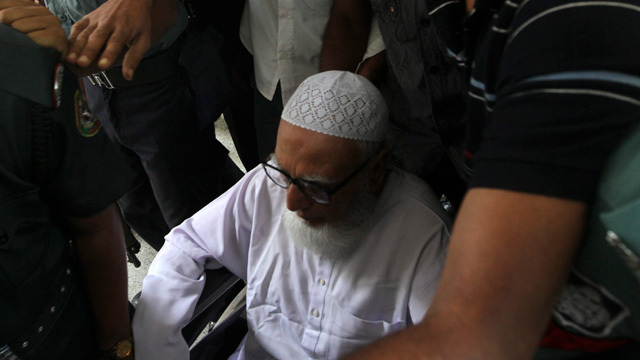 At an age nearing 91, this respected leader and Islamic thinker has been kept imprisoned for some 18 months. In addition, we have been appalled by his treatment during this time. Before his conviction, he was denied access to proper medical care, and was even refused permission to attend the funeral of his late brother who passed away earlier this year. Professor Ghulam Azam is a respected Islamic thinker who is honoured by Muslims all over the world. As a student, he was a leader of the Bangla Language Movement and promoted the cause of Bangladeshis in Pakistan. He has since dedicated his life to promoting Islam in Bangladesh and has written prolifically on this subject. He has made an immense contribution to Bangladeshi politics, including the establishment of the caretaker government system, which has, until recently, continued to be used as the peaceful means of transferring power. Throughout his career, he has never sought fame or wealth, instead living a simple, disciplined lifestyle unusual amongst Bangladesh’s political leaders. As the leader of Jamaat-e-Islami, he has personally suffered much hardship including being imprisoned, exiled and vilified by the media and his political opponents. As a family, we have also by association been subjected to discrimination and mistreatment. My brother former Brigadier General of Bangladesh Army Abdullahil Amaan Azmi was dismissed from the army without a legitimate reason and I myself was unable to continue my academic career in Bangladesh. Family members have been refused visas to travel to Bangladesh without explanation. Ghulam Azam was opposed to the creation of Bangladesh, as were many others at the time, but he was not responsible for any atrocities committed during the war of independence. Like many others, He supported the political unity of West and East Pakistan at the time of the war of independence, but he was opposed to a military solution to political problems and spoke out repeatedly against the crimes perpetrated by the military and paramilitary. Many of his statements during the war were not published due to strict censorship imposed on the media by the Pakistani officials. The 1971 war victims and their families have the legitimate right to receive justice for the crimes committed during the war of Independence from Pakistan. We also agree that the culture of impunity should stop and the real perpetuators of the crimes against humanity should be brought to justice. Furthermore, it is imperative that through punishing the real criminals we bring an end to the slandering and endless character assassination committed by politicians and a large section of Bangladeshi media against their opponents by exploiting the 1971 victims and the sensitivities associated with the War of Independence .The International Crimes Tribunal was set up to try those it says were responsible for the crimes committed during the war. The entire responsibility for war crimes committed by the Pakistani Army has been placed on a few individuals who did not hold any military power or influence, while the real perpetrators have never been brought to justice. The International Crimes Tribunal has been the subject of concern by many leading international bodies and organisations, including the United Nations Human Rights Committee, the International Bar Association, Amnesty International and Human Rights Watch, as well as US Ambassador for War Crimes Stephen Rapp. A number of internationally respected media outlets including The Economist, International Herald Tribune, Wall Street Journal etc have also raised questions about its legality and true motives. The proceedings of the trial have not satisfied demands for justice. Although we did not have much hope that the trial could be conducted fairly, the failures of the Bangladeshi legal system have been exposed and have proven our fears to be correct. Throughout the case, the defence team has been subject to intimidation and prevented from effectively doing its work. They were prevented from having the expertise of international human rights lawyers who were not allowed to enter Bangladesh. In addition, although they presented a list of over 2000 people who were willing to act as defence witnesses, they were arbitrarily restricted to only 12 witnesses. Due to the political turmoil and events such as the kidnapping of defence witness Shukho Ranjan, very few of those witnesses eventually gave testimony in Ghulam Azam’s favour. The prosecution were not restricted in their number of witnesses and had 16 in total. The politically motivated prosecution case is based on hearsay evidence and media reports, much of which cannot be relied on due to the passage of time. A photograph of my father with General Tikka Khan has been used as evidence that he was a war criminal. Ghulam Azam maintains that he was attempting to convince the General to change his policies towards the Bangladeshi people and there is no evidence to suggest otherwise. The prosecution has also argued that he is responsible for the death of police inspector Suru Miah on the basis of a letter which they have failed to produce. He has also been charged with the deaths of 38 men without any proof. The prosecution used some newspaper statements and tried to implicate him through command responsibility; however, they could not produce a single evidence that showed that Ghulam Azam’s statements led to a particular crime in a particular place. It is astonishing that the ICT has found my father guilty without any concrete evidence at their disposal. No genuine evidence or bona fide witnesses have been presented which could prove that my father was responsible for any crimes that occurred during the 1971 war. We believe that the reason this evidence was not obtained, is because he is innocent of the crimes he is being blamed for. The judges in the case have also been proven to be in collusion with the prosecution. The leaked Skype conversations provided confirmation that the trial was being manipulated by Awami League sympathisers abroad, and that judgements were being prepared before the evidence had even been heard. Even though no judge has heard the evidence in its entirety, the tribunal has continued regardless, a fact that has been severely criticised internationally. How can a judicial process claim to be impartial and legitimate when no independent investigation took place to punish those involved in these serious crimes to pervert the court of justice? Rather, the editor of a Bangladeshi newspaper that published reports of the ‘Skypegate Scandal’ has been arrested and tortured under police remand. We have repeatedly requested that the trial should be conducted with the presence of international observers, in an international court, as we do not believe it is possible for a fair trial to be conducted in Bangladesh in the current political climate. This is a hollow victory for the Awami League and not the justice that the victims deserve. It is essential that the appeal process should be internationally supervised to prevent a serious miscarriage of justice. We believe that history will judge this trial to be deeply flawed and unable to provide the standard of justice required for the sentence imposed. Bangladesh wishes to be known as a progressive country determined to right the wrongs of its past. By wrongly convicting my father, the Bangladeshi justice system has failed itself and the Bangladeshi people. The trials have already succeeded in deepening divisions in Bangladesh, resulting in violence and instability. To date, hundreds have been killed and thousands have been rounded up and are suffering in custody. Our prayers are with all those who are facing oppression, malicious prosecution, custodial torture, police brutality and political violence. We call upon the international community to ask the Bangladesh government to ensure that the appeals process is carried out under international supervision so that my father and his colleagues receive fair justice. The government has already interfered with the appeals procedure by appointing some controversial judges to oversee the appeals. Therefore, the need for international oversight in this process is absolutely crucial. We are not afraid of fair justice as we know that my father is innocent, but the way the government is influencing the judiciary process clearly proves how politically motivated the whole process is. If the Appeals Court fails to ensure fair justice and eventually kills him through judicial murder then one of the darkest days in the justice system will be written in Bangladesh. My father is not afraid of death. He strongly said in a TV interview before his arrest that he is more concerned at the plight of the people in Bangladesh rather than his own safety. We love him and are naturally worried about his life. Millions of people around the world respect him for his service to his country and the wider Muslim Ummah. We hope that conscience will prevail over vengeance and through the help of United Nations and the international community, the Appeals Court will ensure that no miscarriage of justice takes place. His many supporters will be upset by today’s verdict, and many protests are expected. We urge everyone to remain calm and protest peacefully for a man we have always known for his peaceful nature. Finally, we would like to thank the defence team for their heroic efforts in representing my father. We appreciate that they have faced many difficulties, including intimidation and threats to their personal safety. We will pursue all avenues available through the appeal process, and are praying that the justice system is able to rectify the failings of this trial by properly reviewing the evidence. Ultimately, we rely on Allah to provide justice, and ask you to pray for him in this blessed month. Chief defence counsel Barrister Abdur Razzak expressed astonishment at the verdict of a 90 years prison sentence given by the tribunal against the former Ameer of Bangladesh Jamaat-e-Islami, professor Ghulam Azam, on allegation of crimes against humanity in 1971. After the announcement of the verdict by International Crimes Tribunal-1 on Monday in the case of Ghulam Azam, in an official response to the verdict Razzak expressed surprise during interview at his home. Barrister Abdur Razzak said, “We are outraged at the verdict. We are surprised at the verdict. We think that, this judgment is unfair and manipulated by emotions. In the history of the criminal cases worldwide, such kind of judgment cannot be found”.